Here’s a collection of some of the weirdest cars you’ll come across. In this era, cars tend to be less creative and exciting as they used to be. Average, run-of-the-mill commuter cars clog the roadways of our great nation. Some cars, however, tried to break the mold of eternal boredom. Here’s a list of the five weirdest cars ever put into production. The AMC Pacer is undoubtedly one of the most hated cars ever sold in the United States. Originally designed to fit a rotary engine, the Pacer was powered by your choice of three dismal, over-sized inline-six engines, plus AMC’s 5.0 liter V8 towards the end of its production run. The Pacer sold in alright numbers, but it wasn’t nearly as popular as its competitors, the Dodge Omni and Chevrolet Chevette. The Pacer’s styling won few people over, with awkward proportions and shape. That being said, the AMC offered a unique alternative to the everyday commuter cars of its day. Many Americans regard the Pontiac Aztek as the worst car ever built. This claim is due in large part to its controversial styling, as the Aztek looks a bit like a bloated rhinoceros. If you can look past that, the Aztek truly wasn’t a bad little SUV. It featured GM’s very advanced VersaTrak all-wheel drive system, which does the same job that modern torque vectoring all-wheel drive systems do. It was very spacious, with 45.4 ft³ of trunk space, or up to 93.5 ft³ with the rear seats folded down. It even had a heads-up display as an option. The Aztek wasn’t a bad car, and people are finally beginning to appreciate it for what it is. The BMW Isetta is the best-known vehicle to come out of the bubble car craze. The Isetta was originally built by Italian manufacturer Iso S.p.A, and BMW acquired the rights to the car. Iso continued to make their iteration of the Isetta, and it was produced by many different manufacturers across the world. Needless to say, the Isetta is quite odd. It is about the size of a decent sized dishwasher. It features a rear-engine, rear-wheel drive layout. Also, the steering column comes attached to the door. That big, wide door at the front was also your only point of exit if your car wasn’t fitted with a convertible top. Furthermore, it wasn’t fitted with a reverse gear, so if you drove your Isetta into a spot where you cannot exit, you are stuck there for all of eternity. A small price to pay for the privilege of owning such a car. While the Fiat Multipla was an average family car, its styling was rather outlandish. It was quite a good car, and it sold well! It’s weird styling only increased its appeal. 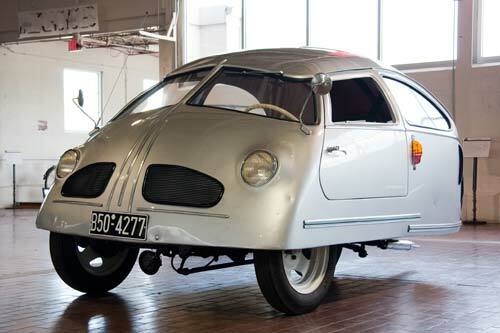 The Hoffmann is undoubtedly the most bizarre car ever built, if not the worst. It is challenging to find something to compare its styling to as it is just so unique. Among its many weird quirks and features, the Hoffmann has suicide doors, a linear shift pattern, rear-wheel steering, and a rear mounted air-cooled engine that received so little airflow that it would often overheat at idle. Also, by rear mounted, it was mounted on the rear wheel’s steering mechanism. As a result, the engine would pivot as the wheel was turned, making it utterly lethal to behold. It was truly awful, but you have to commend the man behind it, Michael Hoffmann, for trying to do something that was unlike anything else ever built.